Share the post "Album review: DEVILFIRE – Dark Manoeuvres"
What the fudge is in the water in Birmingham? Could it really still be that yearning to escape working class, chained-to-the-factory drudgery? Seemingly Britain’s hard-rock Austin, Texas equivalent, Brum has produced some of the world’s finest rocking music over the last fifty years and, since it is apparently somewhat unique in being a major city with no rivers running through it, it must be the grit and grime of the streets and its undeniable history of producing fine rock acts. Where Ozzy and Priest were once born (found?) and raised (dragged up? 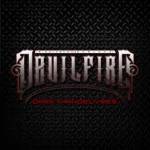 ), enter Devilfire with their debut offering, Dark Manoeuvres. As band leader Alex Cooper fesses up, this album has been a labour of love, re-written and re-worked a few times and these lads have produced a very worthy collection of tunes in this virgin offering. Straddled somewhere between Magnum’s melodic rock sensitivities and the darker, dirtier band which Europe (thankfully) became, Dark Manoeuvres is the product of hard touring, hard knocks and hard life lessons (as well as hard partying) and is laudable because of its honesty and the obvious endeavour and sweat which went into conception. Yeah, there’s a bit of Thunder, there’s a bit of Jepson and the Angels but again, this genre has been ridden hard over the years. Dark Manoeuvres is like watching the England U19s – you raise your eyes in appreciation and think “jeez, nurture this lot and keep them together and their future looks bright indeed”. Go-to tracks – the very cool “She’s Always On The Run” – a fun and obvious, but actually very nailed-on Bond theme idea; “(In And Out Of Love) All Of The Time” – smoldering and classy, a real beauty, this one; “Tear Me Apart” – getcha Zippos out; “She’s Like Fire” is a proper rock and romp about the lass that got away; “(You Gotta) Revolution” is that obligatory, middle-finger-to-world-politics and brims with anger and pissed-off purpose and one of my personal favourites, “Lay It On The Line” (but then I’m a sucker for a descending riff). Also, get into “Kill Your Love” – for a moment there, I was back in my bedroom, in front of the mirror with my tennis racquet…brilliant. This entry was posted in ALBUM REVIEWS, ALBUM REVIEWS (Mobile), All Posts, The Best of 2017 and tagged album, Dark Manoeuvres, Devilfire, hard rock, melodic, review, rock. Bookmark the permalink.